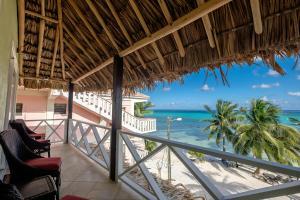 ﻿ Best Price on Seven Seas Resort in San Pedro + Reviews! Offering outdoor pool, a sun terrace and stunning sea views, Seven Seas Resort is located in San Pedro Beach. Free Wi-Fi access is available. All condos have cable TV, a balcony and outdoor furniture. There is a fully-equipped a kitchen with a microwave and a refrigerator. Private bathrooms also come with a hot and cold shower. Included is the free use of beach towels and Kayaks. Guests can find a supermarket to buy groceries within 328 feet and a variety of restaurants offering local food are 10 minutes’ walk away. Philip Goldson International Airport is 35 mi away and San Pedro Town Center is 5 minutes’ drive away. Street side parking is available.